THE CANADIAN PRESS/Paul Chiasson. 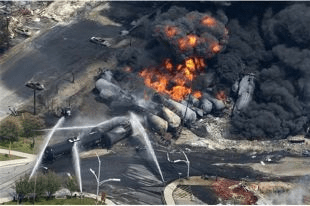 Smoke rises from railway cars that were carrying crude oil after derailing in downtown Lac Megantic, Que, Saturday, July 6, 2013. Crude oil moved along Canadian railway lines in unprecedented volumes in 2013 as delays in building new pipelines caused oil companies, clamouring to reach the most lucrative markets, to seek out alternative paths. The crude-by-rail trend had been gathering steam quietly in recent years. But after the disaster in Lac Megantic, Que., it could no longer fly under the radar. There was no time to cry, no time to let the tragedy sink in — there was only time to help those that survived. Even as she recounts the story today, Laroche remains calm, talking about phone service that was completely cut off and turning to the media to communicate with residents and to encourage them in the face of what had happened. More than 80 fire departments came to help fight the massive fire and the provincial government sent what help it could. Laroche said more than 100 businesses in the downtown, that provide professional services, were relocated while 50 business, as a whole, were also moved. Rebuilding the town is going to take a while, she said. “We need three to five years before we can rebuild the area affected by the disaster,” Laroche said, noting that the total rebuild could take a decade. Four condominiums in the area were turned into makeshift businesses with some opening in the next month or two. Laroche said there is still so much to do. The town is now planning major consultations with residents. Some residents want the town rebuilt as it was, others want a new image. Laroche said if there is a positive that came out of the tragedy it’s that it has brought the residents of the small Quebec town much closer together.